If you are local to Montrose or just passing through a tasty pizza place is always a good thing to have on a hungry person’s radar. Montrose has some great options sure to satisfy even a picky pizza aficionado. Here are a few of our favorites. Colorado Boy Pizzeria & Brewery located on Main Street is known for its delicious pizza and extensive brewery selection. They have a rustic, yet modern atmosphere and customers love the fresh ingredients and friendly service. Try the Cowboy pizza is always a hit. As a bonus little pizza fans are given their own pizza dough to play with. Pahgre's Pizza Pasta & Subs located on Oxbow Drive specializes in hand tossed, stone baked pizza. Their pizza never disappoints, and customers love the laid-back atmosphere and large menu with the items named after local rivers and mountains. If you are not in the mood for pizza they have lots of tasty pasta, salads and calzones to choose from, and a large kids menu. Creekside Restaurant on is a recently renovated upscale restaurant on Cobble Drive. 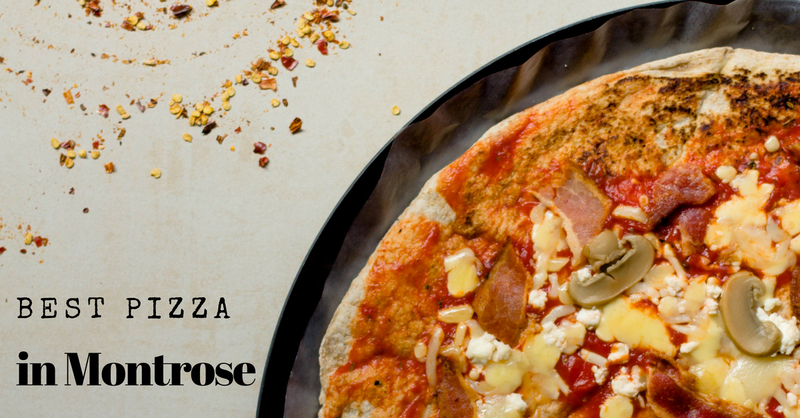 Their ingredients are locally sourced, and their menu not only has scrumptious wood fired pizza, but also everything from bacon wrapped dates, juicy burgers, fresh pasta of the day and crispy salads. Customers also rave about the refreshing cocktails and large wine menu. Creekside restaurant also offers a weekend brunch.